Tyler Quinn was born and raised in a small country town in Western Australia. He has always had a keen interest in sports and fitness and moved up to Perth to complete a degree in Exercise and Sport Science. During this degree, Tyler increased his knowledge in anatomy and physiology and learned about the importance of nutrition and exercise to optimise your body’s potential. 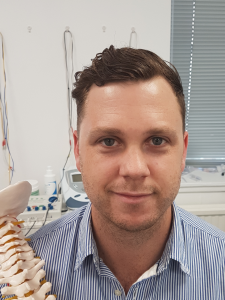 Having been treated by chiropractors from a young age, for various conditions and injuries, he has seen first-hand the positive effects that chiropractic care can have on your physical health and well being, and chose to further his education and train as a chiropractor at Murdoch University in Perth, Australia. After completing his 5-year chiropractic degree, Tyler moved to Edinburgh and joined the team at Edinburgh Chiropractic Group. He is passionate about helping people reach their full health potential through holistic chiropractic care. Tyler is registered with the General Chiropractic Council and is a member of the Scottish Chiropractic Association. Tyler has worked as a sports trainer at several sporting clubs and continues to be closely involved with sports and athletes. In his spare time, he enjoys watching and playing a range of sports including Aussie Rules Football, fishing, surfing, snowboarding and likes hiking and camping and exploring Scotland. Tyler is a friendly, outgoing and approachable chiropractor, who is eager to meet you and discuss how chiropractic care can positively influence your life.